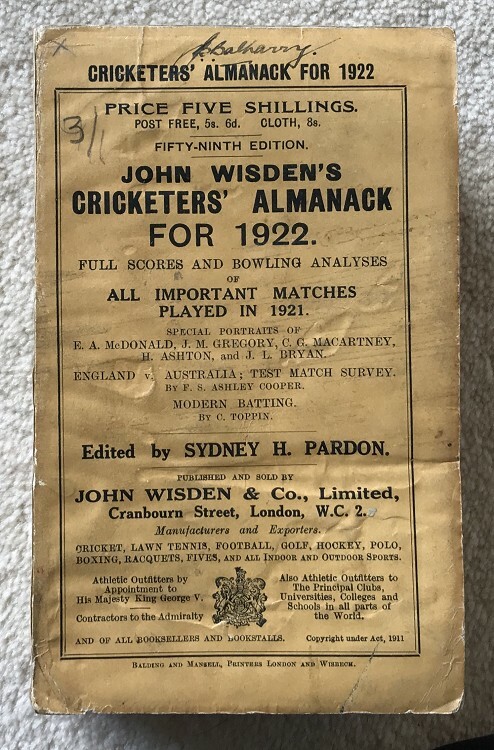 This lot is an Original 1922 Wisden Paperback with facsimile spine. This is in Good to Very Good condition, the covers are nice and tall. They are a touch dark with marks accross the middle of the front and a heavy mark to the rear cover at the bottom. Name and price to the front cover at the top. A nice new spine with text has been added , it is neat and tidy but not an exact copy of an original Wisden. 1922s have different colour covers to the later 1920s so the spine isn't an exact match. Excellent inside with clean pages and tightly bound until the last couple of pages which have a heavy mark. Clean page block and an excellent photoplate.